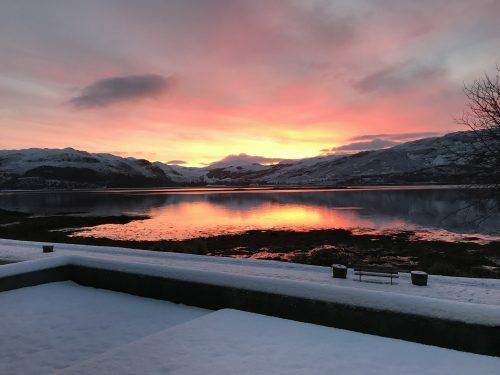 We are very excited to be working with Moran Mountain – renowned mountain guides based in this wonderful location and offering a range of incredible mountain experiences both here in Scotland and further afield! 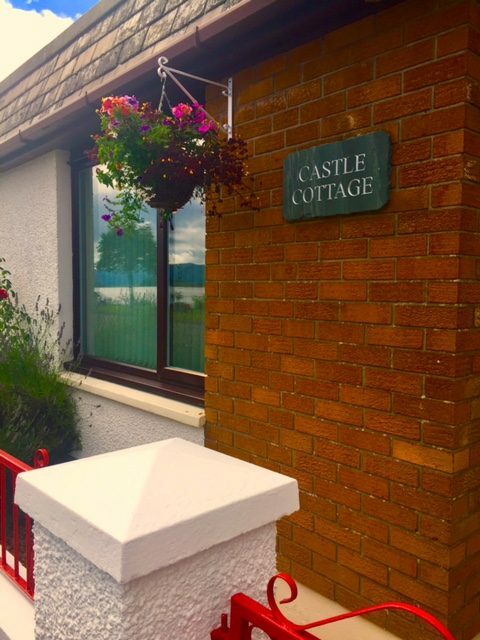 For their Scottish based events we are now providing full board accommodation here at Castle Cottage in the centre of Lochcarron Village. We look forward to welcoming you! We are one of Britain’s most experienced mountain guiding schools offering coaching, adventures and expeditions in North-West Scotland, Norway, the Alps and the Himalayas. Founder Martin Moran, a British Mountain Guide, set out in 1985 to offer guiding in some of the worlds most stunning mountains. Today, Moran Mountain has over 30 years experience and has built a talented guiding staff. Our passion for mountaineering and adventurous spirit remains as strong. We have helped thousands of aspiring climbers to realise their mountaineering dreams. From hillwalking to technical climbing…. your next adventure starts here! 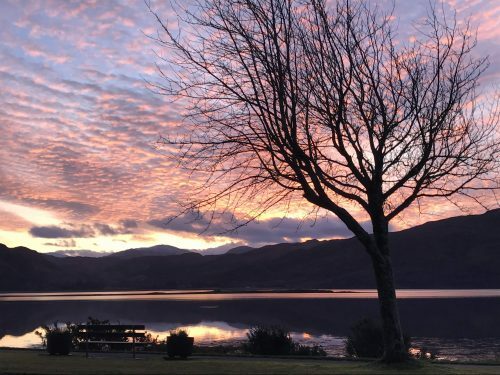 For those looking for a Scottish adventure, our base is Strathcarron in Wester Ross, at the threshold of the North West Highlands, home to some of the finest mountains in Britain. An Teallach, Liathach and the serrated ridges of the Cuillin of Skye rise in majestic isolation above the sea. From Strathcarron we can access all the peaks of Torridon, Applecross, Kintail, the North-West Highlands and Skye. The Cairngorms and Ben Nevis are also within our compass. We are just 90 minutes minutes’ drive from Inverness airport. The tranquility and unspoilt nature of the North West awaits you. Enjoy a sense of adventure and freedom as you explore new peaks and routes each day. Our local guides relish the challenge of an untracked ridge or a icy gully. Since setting up Moran Mountain in 1985, we have led our clients over 70 traverses of the Cuillin Ridge and recorded over a hundred new routes in the area. 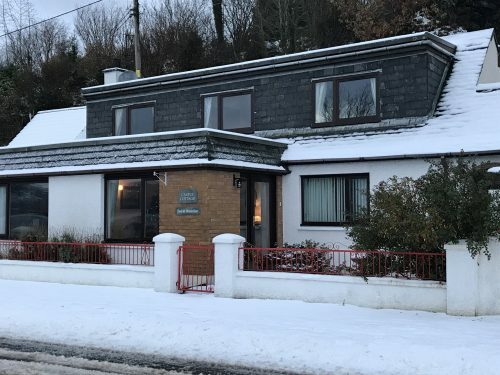 We provide all the home comforts you crave after a good day on the hill with superb home-cooked meals and cosy lodgings in the heart of this dramatic mountain landscape that we are proud to call our home. Our Scottish Winter courses offer instruction and guiding in the essential winter mountaineering skills plus steeper snow, ice and mixed climbing. We traverse some of Britain’s finest ridges, teach survival skills and develop your navigational abilities. Techniques and experiences acquired with us will prepare you to climb in the Alps and Himalaya. We run 5-day courses through the winter season plus a 4-day New Year special as well as 2 day weekend courses for friends, couples and small groups. We’d like to wish you all a very Happy New Year! 2018 was a busy one for us, with lots of time spent exploring this beautiful area, something we hope to expand on in 2019. 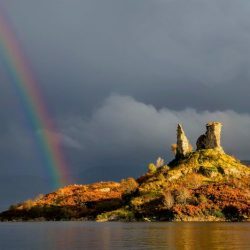 Visiting this special part of Scotland can be so rewarding with something for everyone and it’s important to know you have quality bed & breakfast accommodation to look forward to. 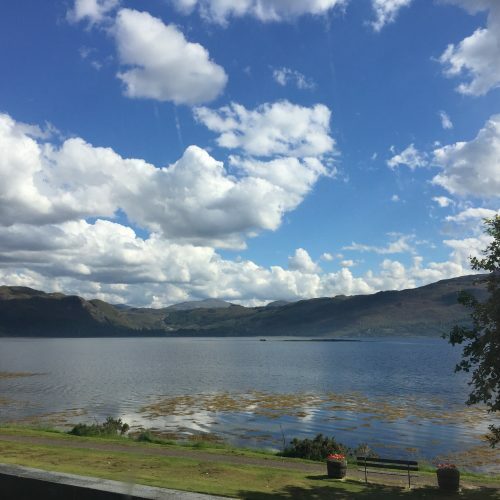 We are fortunate to live right by the sea, with a coast that is breathtaking – and with easy links to further attractions such as the Isle of Skye, and the north West up to Ullapool and Durness. For the Munro Baggers out there, this North West Highlands is Mountain heaven!! We have a great range of hills on our doorstep, with the Torridon, Cuillen and Glenshiel areas all very close by. If you are interested in more gentle days out, then there are plenty of lower level walks in the local forest, estates & along the coast. The path of the NC500 passes right by our door; we are an ideal first night stop if going clockwise, or a last night treat on an anti-clockwise route! Many of our guests spend a night with us as part of a touring route, but if you have the time it’s well worth spending at least 2 nights in each of your stopover locations to give you time to explore, otherwise it can be a little rushed… If you enjoy the great outdoors, there are some great activity and sightseeing options all around us. We have sea kayaking, sailing, paddleboading, caving, canyoning, mountainbiking and hillwalking activities all within a few minutes drive. 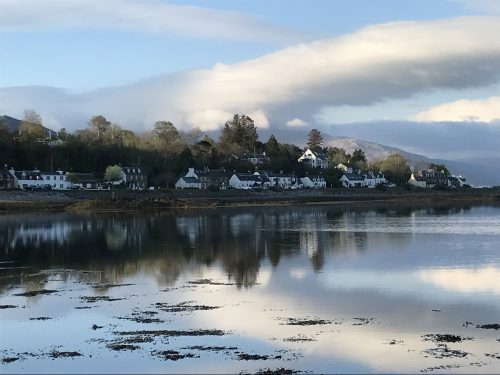 We are fortunate to have Attadale Gardens, Plockton, The Applecross Peninsula and Estate Gardens all nearby too, with Inverewe gardens a pleasant drive up the coast. The Highlands of Scotland is a real hidden gem, with so much to explore. Come and stay with us, and experience this amazing place for yourself. 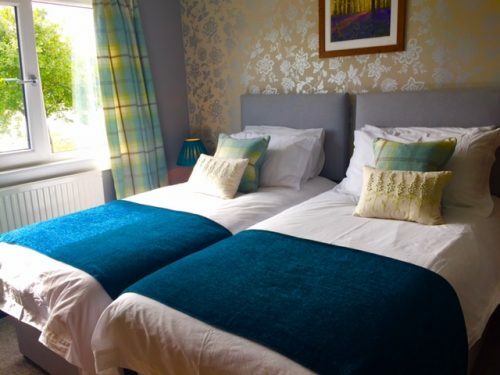 We offer high quality Bed & Breakfast accommodation – with twin and kingsize double room options available. 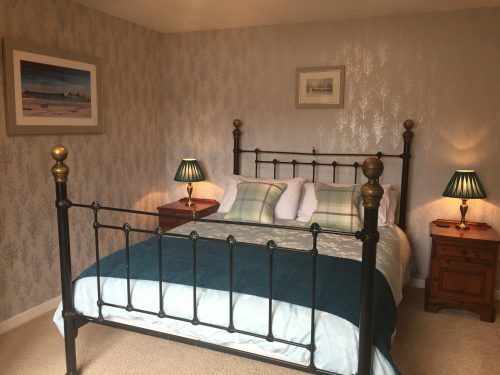 With a very generous Scottish breakfast and stunning views, a warm welcome and very comfy beds, this is a perfect place to recharge your batteries. Any personal data provided to Castle Cottage, is used only to make and manage accommodation bookings. This relates to reservations made directly by phone or email, via the 3rd party booking software embedded on our website (Freetobook) or via the 3rd party platform Airbnb. As part of the booking process you will be asked for personal data which may typically include name, address, telephone number, email address along with additional guest data and when accessing a reservation through one of the 3rd party platforms, this may also include your IP address. This information is stored within our systems purely to process your booking. Your data is retained after you have stayed with us, but no longer than is reasonable to comply with our legal obligations. When making a direct reservation via telephone or email then Castle Cottage B&B is your Data Controller. When accessing Freetobook software to facilitate an online booking, then Castle Cottage B&B and Freetobook shall together operate as joint data controllers for the processing of your personal data. The storage of your data may be needed to perform the contract that you have with us as your accommodation provider or your booking platform. When accessing Airbnb to facilitate an online booking, then Airbnb is your data controller. As a small business, we use minimal personal data from you and we take all reasonably practicable measures to protect any personal data. Only authorised members of the Castle Cottage B&B team may access your personal data. You can email or write to us with a request to review your information. You can review any data to check it is accurate and appropriate. You can check how long any data is kept for. You can request for data to be deleted. Your personal data will never be sold to a third party and is held purely for the purpose of making and the associated communications relating to a reservation. We do not carry out marketing mailers, and will only ever contact you when required in the administration of your reservation with us. You may be asked to write a review – in the form of the visitors book, online, or via the feedback procedure of our 3rd party booking platforms. Reviews may be used for marketing purposes such as social media, websites and linked websites. However all reviews do not contain personal, identifying or contact data. The beautiful Highlands of Scotland can present some travelling challenges to anyone not familiar with our single track roads. The ‘etiquette’ for happy travelling does vary, but there are some easy tips to help you on your way! 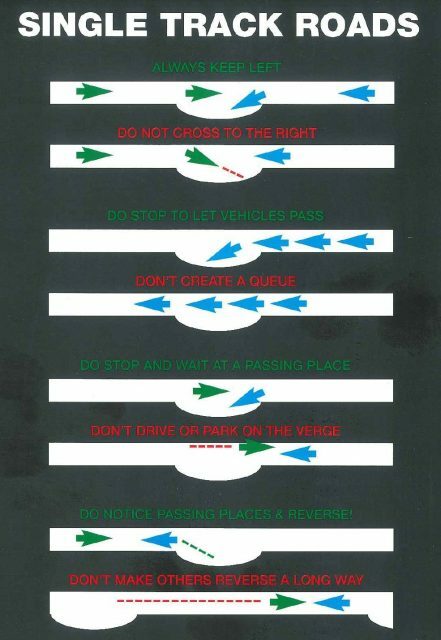 Our local tourism group has shared this nifty illustration with us, and we thought it could be helpful to anyone heading our way this year. There are always going to be difficulties balancing the needs of the tourist (typically moving more slowly, enjoying the view) and the local (desperate to get from a to b as fast as possible) when sharing the same stretch of narrow and often pot-holed road!! Following these helpful tips may well improve your experience, and help to keep the blood pressure in check…. This is the current MetOffice forecast for the NW Highlands..